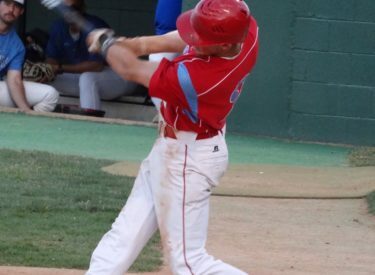 Liberal took two over the Haysville Aviators Wednesday afternoon and evening at Brent Gould Field. The Bee Jays won the first game 10-3 and the second game 15-3. In game one, Cody Wernli pitched four innings allowing two runs in the win. Tyler Tognarine went two innings allowing one run and Chance Carner worked a scoreless seventh in the seven inning game. Haysville scored in the first after three singles. Colton Onstott blasted a three run homer over the right field wall to make it 3-0. Haysville scored a run in the fifth to make it 3-2. Trent Maloney led off the sixth with a double down the first baseline. Jaron Robinson singled him home to make it 4-2. He would later scored as Liberal hit into a double play. Chad Kennedy and Marcus Shoemaker added RBI singles to make it 7-2. Liberal added three more in the seventh for good measure. Liberal was the visiting team as this was a makeup game from June 15 at Haysville. Maloney singled to lead off the seventh. Robinson tripled him home. Onstott doubled home Robinson. Caleb Ward added a sac fly. Maloney was 4-4 and Onstott was 3-4. In game two, Liberal was back to being the home team. The Bee Jays broke this game open early. Marcus Shoemaker and Zac Cook singled to begin the first. Garrett Scott grounded out to score a run. Jaron Robinson singled home a run. Liberal scored nine in the second on just three hits. The Aviators had three errors. After a walk and two errors, Shoemaker tripled home a run. Then another error and a walk. Robinson hit a sac fly. James Hardberger blasted a two run homer in the fourth to make it 13-2. Maloney doubled to lead off the fifth. Brenon Rhodes singled. Gage Teer singled home a run. Zach Autin went 3 and 1/3 allowing two runs. Caleb Ward pitched 1 and 2/3 allowing one run. Thomas Garland pitched a scoreless inning and Trent Maloney finished the game with three strikeouts in the seventh. Liberal is 18-4 and the Aviators are 5-17. Liberal hosts Haysville again Thursday night at 7 with the Dugout Show at 6:45 on 1270 and kscbnews.net. Golden Plains Credit Union is the buyout sponsor and will have prizes for fans at their tent.